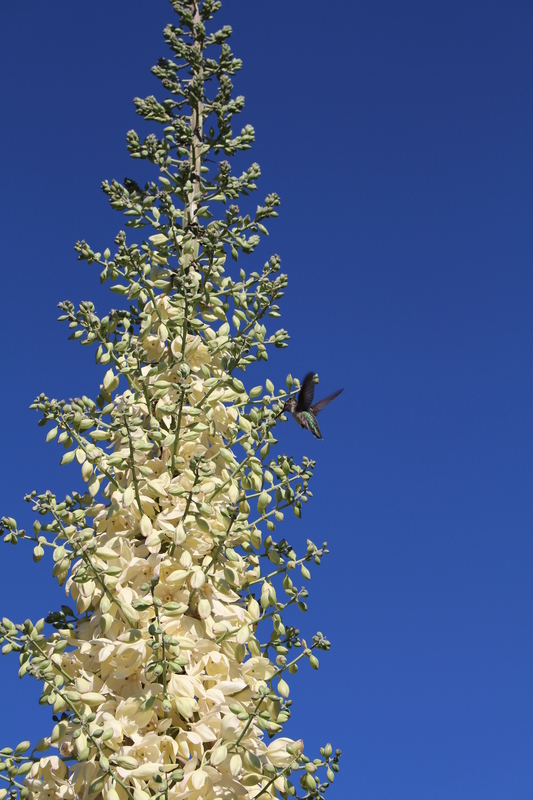 Since last I posted, you read, Lisa and I reconnected with some hiking buddies, missed out on a party at some natural hot springs, ate at our first L.A.-style fruit stand, experienced Del Taco, and traversed the desert at night. It has been very hot out, even in the higher elevations, and water has been in short supply. As I tend to go a bit insane when there’s no water in my pack (picture Humphrey Bogart coveting gold toward the end of Treasure at the Sierra Madre) Lisa and I have both been very meticulous in plotting resupply and making sure we stay hydrated. No descent into madness has occurred… yet. We left the San Bernadino National Forest and are now in the Angeles National Forest, although the “forest” is in short supply below 8,000 feet. Radiating rocks and clay, hot white tributaries of sand, and stubby and shadeless bushes are plentiful. It’s been in the high eighties and a surprising number of hikers have been hiding out in towns or hitching rides around some of the longer, desert sections. We’re frankly a bit surprised by how often this occurs. Folks we have passed on one day will appear the next, usually by a watery oasis or a patch of civilization. Everyone has their own idea of what a thru-hike is, I suppose. The day after departing Big Bear Lake, Lisa and I caught up to some friends, Reid, a mechanical engineer from Blacksburg, Virginia, and Noah, a recently retired marine from Orange County, CA. They’re a great pair of guys, very different from one another but excellent hiking buddies. 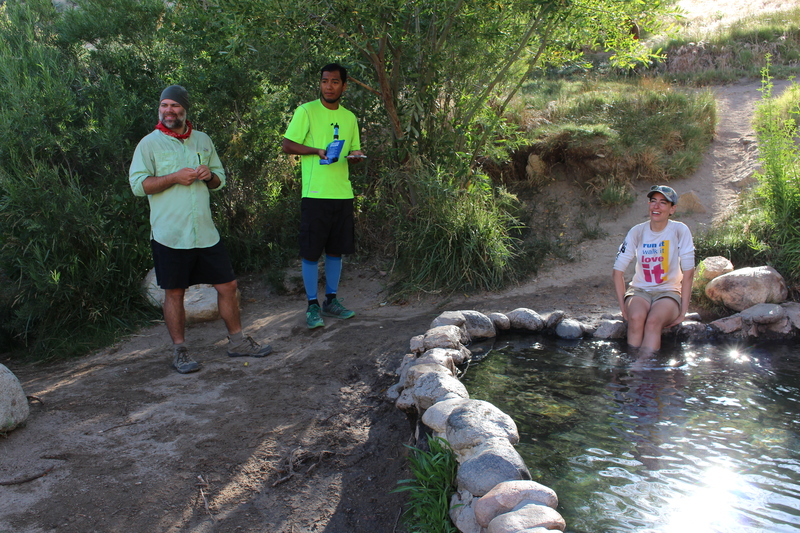 We rejoined them in the morning at some hot springs along the trail. Sleepy hikers, both local and thru-, lay about after what appeared to be a hard night of partying. Lisa was sad to have missed out on soaking in the springs while I was rather relieved. After a week of unfamiliar faces, Lisa and I were pleased to join up and hike with Reid and Noah for the next few days. Noah in particular is excited to introduce us to anything remotely associated with southern California culture, including a fruit cocktail near Interstate 15 in Cajon Pass. 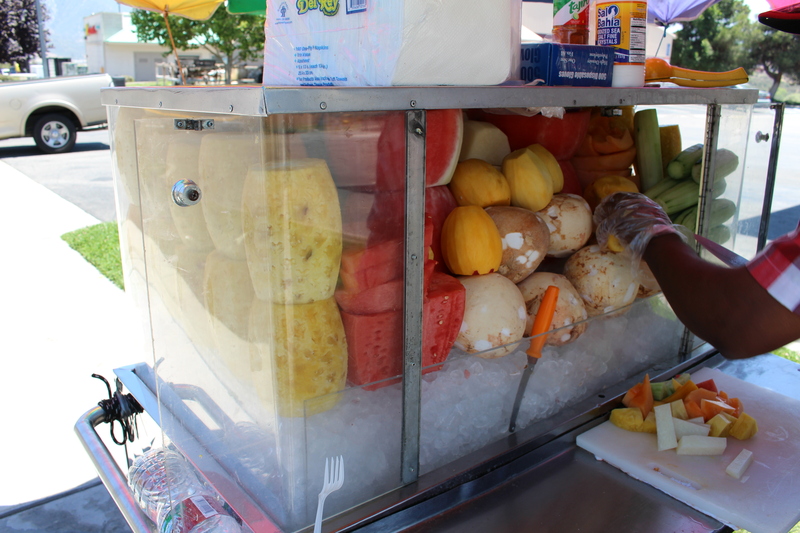 Stopping at a food cart with a bright, rainbow patterned parasol, Noah insisted we order the works: chunks of pineapple, watermelon, cucumber, mango, cantaloupe, coconut, and (totally new to me!) jicama, all of it doused in chili sauce and lemon juice. Delicious, although Lisa was not into the chili sauce. The rest of the afternoon was spent at a gas station/Del Taco restaurant, gorging on fast food and watching traffic on the highway nearby. Some people pulling into the rest stop eyed us askance while others asked us where we were hiking. 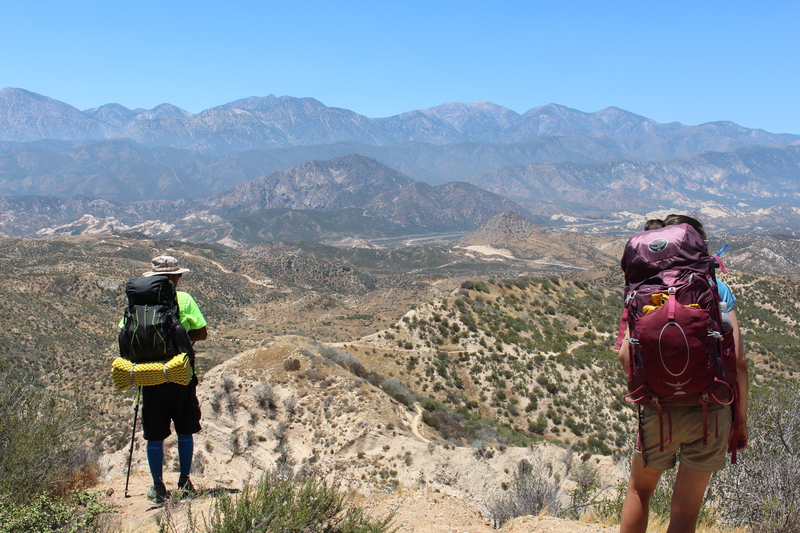 A surprising number knew of the PCT. Reunited with Reid and Noah at the hot springs of Deep Creek. Lisa enjoys a brief soak before we start hiking again. Reid decided to stay in a hotel at Cajon Pass. He let the rest of us use his shower and rest in his room for a bit. Noah, Lisa, and me ventured out under a waxing moon, under the highway and beneath some very active railroad tracks, and climbed for five miles into the night. The moonlight threw our own shadows onto the sandy trail, which glowed like a white ribbon and was so bright that we did not need to use our headlamps. For long stretches we would hike along narrow ridgelines with large drops into darkness to either side, the electric ooze of thick traffic on the highway below appearing strangely foreign and unreal. The hike was thrilling but at the end of a long day we cut the evening stroll short and made camp by a water cache on the San Andreas Fault. 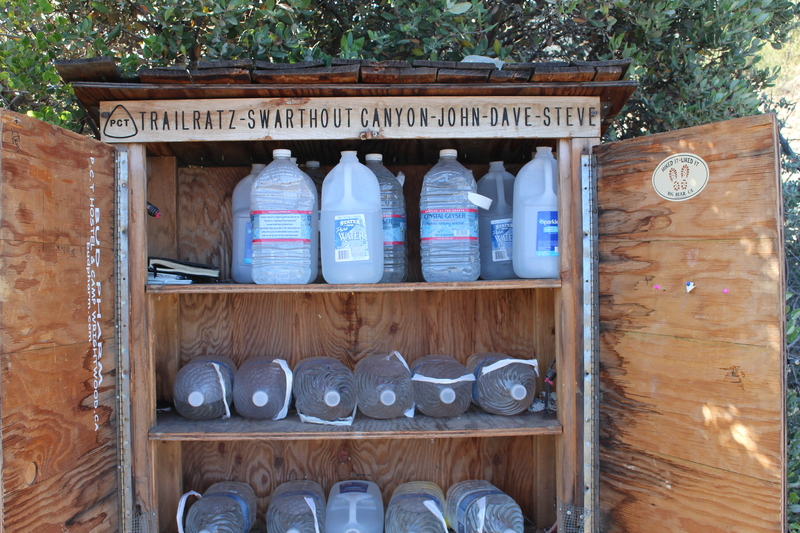 The water cache near where we camped after our night hike. A visitor to our campsite. We’re now in the mountain town of Wrightwood. We’re more than halfway done with the blasted desert. I’m counting down the miles. Sun without shade and water is not much fun. Hiking by moonlight sounds much cooler and even magical the way you describe it, but what about the rattlesnakes? Can you see well enough in the dark to avoid disturbing any such critters that are on the trail?! What??? Camping on the San Andreas Fault???? I thought I told you to “run across the San Andreas Fault”. Next resupply has been mailed to Hikertown. Love the Blog. Hope to hear from you soon. Love, Mom.